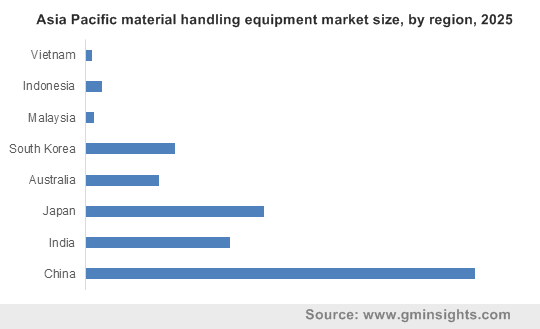 Asia Pacific Material Handling Equipment Market size was valued at over USD 50 billion in 2018 and will grow at a CAGR of around 7% from 2019 to 2025. The shipments are expected to reach over 120 million units by 2025. Rapid industrialization in several countries including China, India, and Japan is driving the Asia Pacific material handling equipment market. The region is witnessing an increase in the adoption of automated technologies in various industrial sectors to improve the efficiency and performance of business processes. These countries are continuously engaged in increasing their manufacturing or production capabilities to avoid depending on other regions for the import of machine parts and accessories. Such factors are driving the establishment of manufacturing industries in these countries to cater to widespread industrial demands for different parts, machines, and tools, providing an impetus to market growth. The food & beverage industry is witnessing a high adoption of equipment due to the rising demand for automation. The automated technologies will allow these companies to perform their tasks in a comparatively lesser time and efforts. Moreover, the industry is flourishing at a rapid pace due to the changing customer demands for food products. In 2018, the food & beverage industry in the region accounted for over USD 800 billion. Such factors are encouraging food & beverage companies to adopt innovative technologies that will enhance the productivity and reliability in their business operations. The substantial growth of the food & beverage industry accounts for the high demand and the need for automated equipment to handle products, driving the market growth. 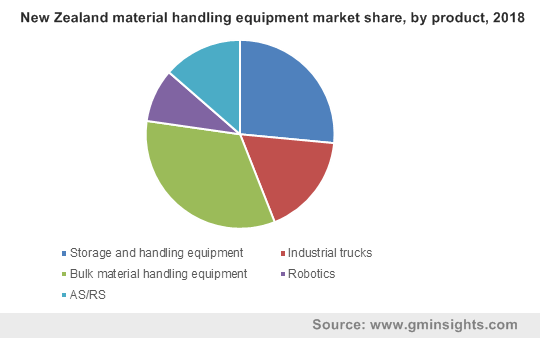 The APAC material handling equipment market is witnessing high adoption of new machines with rapid technological advancements and innovations in these products and increasing requirements of modern technologies to accelerate the business process and industrial operations. Several industries are engaged in transforming their traditional manual business operations to automated ones. Some of the innovative technologies that are revolutionizing the material handling tasks include remote monitoring, digital analytics, and autonomous vehicles. The growing adoption of these technological solutions in several industrial segments will drive productivity and business efficiency, thereby accelerating Asia Pacific material handling equipment market demand. 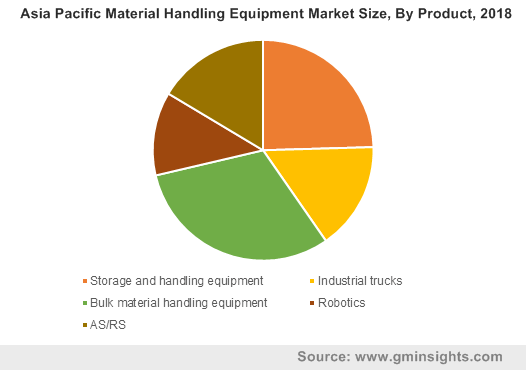 The aftermarket robotic parts and accessories witnessed a high demand in the Asia Pacific material handling equipment market and will grow at a CAGR of over 5% over the forecast timespan. These robotic products are integrated with technologies, offering advanced functions and features to industrial operations. With the continuous and regular operations of these machines daily, the machine parts and components require periodical maintenance. The hardware components have a specific operational life, after which it needs to be replaced with new components. Such factors are expected to be the key driving factors for the APAC material handling equipment market. Moreover, manufacturers operating in the industry are providing machine components with advanced features, lifetime, and efficiency, driving companies to replace their outdated parts with modern components. In 2018, direct sales to the customer was the most widely adopted sales channel for new equipment and accounted for over 50% APAC material handling equipment market share. This sales channel allows manufacturers to offer innovative solutions to their end users, helping them analyze the customer requirements. The analysis provides manufacturers effective product development strategies by keeping in mind the customer needs. It also allows manufacturers to establish customer relations and aids in driving the sales of their business offerings. Moreover, the customers are dependent on manufacturers for business-specific solutions in a very affordable range as compared to retailers, distributors, and other sales channels. The rise in the adoption of direct sales network over the coming years will drive Asia Pacific material handling equipment market growth. The e-commerce industry is witnessing a high adoption of the equipment owing to the increased interest of customers for online shopping and retailing and will a grow at a CAGR of around 10% from 2019 to 2025. Rising internet penetration and improvements in economic conditions are the key factors driving the e-commerce industry. Countries including India and China are among the major markets that have a wide customer base in online shopping and are generating a high number of fulfillment orders. With high online orders, the e-commerce players are adopting advanced and automated equipment to speed up the operations. Belt conveyors are the most widely adopted material handling technology in this sector. These machines are used to convey the packaged products to the warehouse with the help of automatic technologies. The rise in the adoption of conveying solutions in the e-commerce industry will accelerate APAC material handling equipment market growth over the forecast timespan. The rise in adoption of the machinery in countries including Indonesia, Malaysia, Thailand, and Taiwan is being witnessed owing to the ongoing automation in industrial sectors. These countries have a strong presence of global manufacturers that provide effective solutions based on business requirements. In addition, the government support and favorable business environment are encouraging manufacturers to expand their business presence in the region. The high availability of third-party suppliers and distribution channels is aiding companies to produce and deliver their offerings effectively to end users. Rapid urbanization and developments in economic conditions will drive the demand for modern solutions. Moreover, with the increasing demand for such modern technologies and the need for effective product handling solutions, the Asia Pacific material handling equipment market will witness a steady year-on-year growth. Key players operating in the Asia Pacific material handling equipment market are Bastian Solutions, LLC, Clark Material Handling Company, Beumer Group GmbH & Co., KG, Crown Equipment Corporation, Dematic GmbH & Co., KG, Hyster-Yale Materials Handling, Inc., JBT Corporation, Kion Group AG, Liebherr, KUKA AG, Mitsubishi Caterpillar Forklift America, Inc., Intelligrated, Inc., Kardex AG, Siemens AG, and Toyota Industries Corporation, among others. These manufacturers are engaged in developing innovative technologies with a high level of product differentiation. The companies are competing in the market by offering such innovative solutions and diversifying their product offerings. Moreover, the growing importance of material loading and carrying in the logistics industry is encouraging vendors to implement automatic machines, which will support difficult tasks and functions laid by the workers manually. 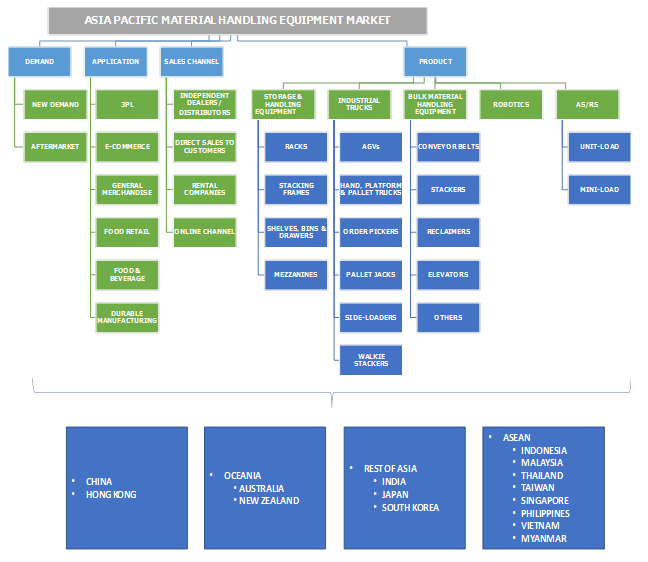 The Asia Pacific material handling equipment market consists of major companies that are expanding their global presence and distribution network to offer their customers with wide range of products and solutions based on the industrial requirement. The players are engaged in a partnership with component suppliers, technology providers, and distributors for the proper availability of their products in the APAC material handling equipment market. In addition, the global players are initiating strategic partnerships and alliances with domestic companies to expand their product offerings and customer base in the region. For instance, in October 2018, Liebherr Group acquired the business operations of Morrow Equipment Company in Australia and New Zealand.